Sitting under the dryer is one of the most dreaded past times of anyone that’s ever gone to a hair salon. So when you decide to maintain your locs at home, naturally you don’t want to subject yourself to such torture. 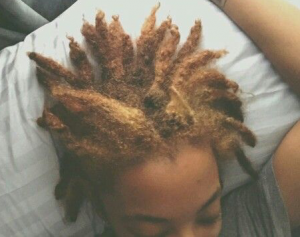 However, by air drying your locs you may be putting your locs at risk and causing more problems than you realize. 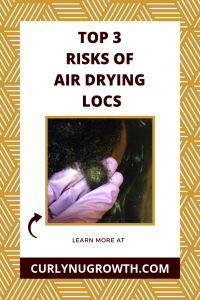 In this article, I am going to share with you the biggest risks of air drying and tips for properly drying your locs at home. One of the most common causes of flat locs is residual dampness left inside the locs from air drying. Due to the fact that hair takes on whatever shape it is dried in. When you allow residual water to remain inside the locs and then compress on them by laying down or putting on a hat/scarf it will lead to them becoming flat. 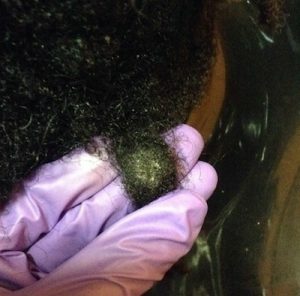 If you constantly air dry your locs and they do not thoroughly dry, fungus can develop within the center of your locs which will lead to a mildew odor. Not to mention, removing the mildew odor can be a very tedious, sometimes unachievable task. 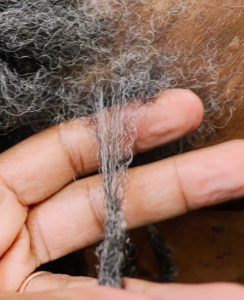 When the locs are not “set” into place with a concentrated heat source they will unravel or loosen at the roots much quicker than locs that are properly dried. Also, when you’re styling your locs, especially when you want curls, if the locs do not fully dry, the style will not last and will fall within a few days (if not hours). Typically, curly styles that are properly dried will last for weeks! So now you may be wondering, “how do I dry my locs without sitting under the dryer for a long time?”. Well, I am glad that you asked because as someone who also hates sitting under the dryer, I have a few suggestions for you! After you shampoo your locs, if you use a towel that is designed for use on hair, it will absorb at minimum 3x more moisture than a cotton towel or t-shirt. This will also minimize your drying time whether you sit under the dryer or air dry. Also, the towels designed for hair do not shed so they’re lint-free and you won’t have to worry about lint-buildup in your locs. A lot of times we neglect the ends of our locs once our hair gets long, especially when it comes to sitting under the dryer. The solution— a bonnet dryer. The bonnet dryer covers your locs from roots to ends so that all of the locs dry evenly. 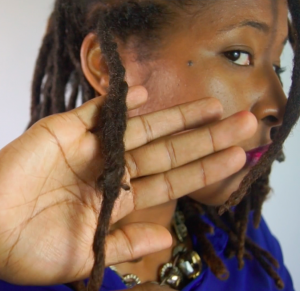 Also, you want to remember to use low-medium heat for drying your locs so that your locs don’t end up hard and crunchy. Instead of completely air drying your locs for hours (or days), use a concentrated heat source, such as a Bonnet Hair Dryer Attachment , for a minimal amount of time (30 minutes or less) to remove excess moisture and then continue to air dry. This is especially important if you plan to let your locs dry overnight. How do you dry your locs? For curly locs should it be curled when locs are dry and not wet? This information was very informative I now know how to dry my locs proberly. Is this especially important for starter locs? It is especially important for starter locs to be dried completely. You don’t have to worry too much about mildew and such at the beginning stages but if you want your locs not to be flat and/or have a lasting retwist, it is important to utilize a hair dryer. Than you for all your post you’ve taught me a lot and helping me through my process. I understand the importance of drying your locs. Thank you this has been informative. Is it good to use a cool air to dry my locs vs the hot air from a hand dryer? What’s most important is fully drying your hair. 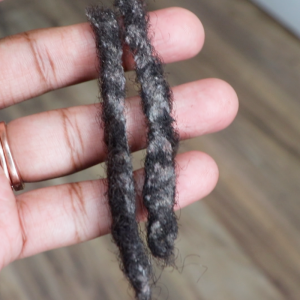 The cool is will take a lot longer to fully penetrate the locs and dry them completely, but, on the other hand, if the air is “too hot” is can overdry your locs and make them brittle.